Amazing Quality Products at Amazing Prices – Shop Now at Get India Store – Best Marketplace ! Pick one of the trendy and classy fruit bowls from Sanjeev Kapoor and set it on your table. Filled with your favourite fruits and healthy veggies, this bowl will certainly look fabulous. Make sure you keep your fruits stacked together looking beautiful. Sanjeev Kapoor ,the most celebrated face of Indian Cuisine is undisputedly the most dominant brand in the Indian Culinary Space . He has been bestowed with one of the most prestigious civilian awards, the ‘PADMA SHRI’ by the President of India . ‘BEST CHEF OF INDIA’ – the National award has been conferred on him by the Government of India . His foray into the Premium Lifestyle House-ware Segment has been marked by the introduction of various products under his brand name “Sanjeev Kapoor” such as Kitchen & Table Linen, Crockery & Glassware range . 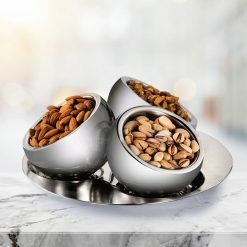 However, sighting the need for a Premeium Lifestyle Metallic Tableware Collection, he introduced an array of these products i.e Dinnerware , Cutlery , Barware , Snack Server , Gift Sets and other accessories that have been intricately designed to suit the contemporary lifestyle preferences of the modern Indian consumer . Providing customer satisfaction is our top priority. Facing any problem regarding your order or purchase, we are always here to help you. We only sell products of premium brands and you can expect premium quality products from them. All products are imported directly from these brands. At Get India Store we always try to make sure you get the best deals and get the premium products at lowest price available in the market.